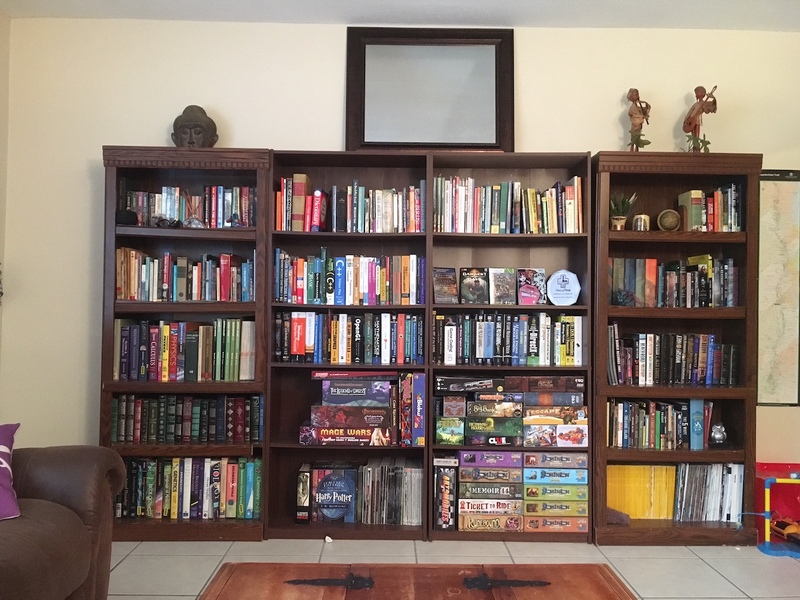 No game development arena would be complete without a library of books, actually google does pretty well these days – but I also have a fair collection of table top games for those times when the power goes out, sometimes I even play them with the power on! Next in the arena would be whiteboard space for create endless todo lists that never get complete, brain storming, drawing silly diagrams how I want something to work. The post-it notes are actually the initial plans/tasks parts to the TurtleBrains C++ game development framework. 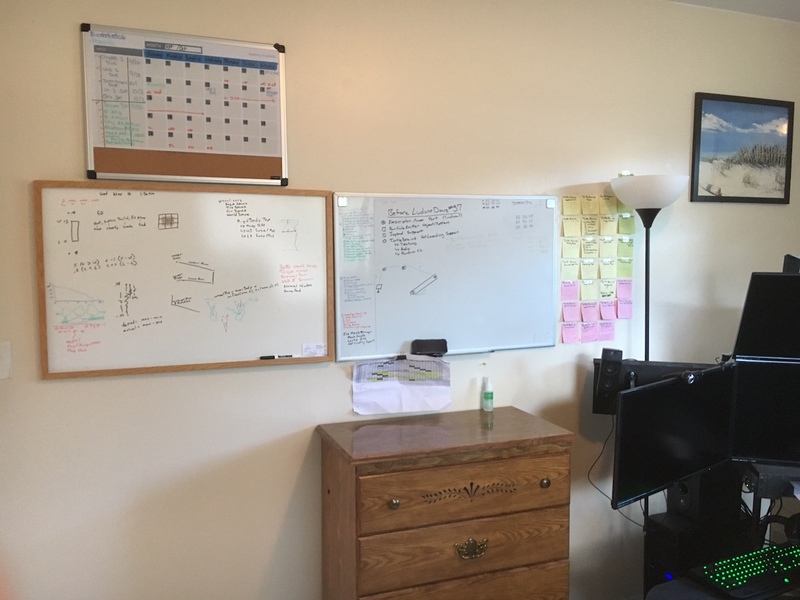 Also another small, double sided, white board next to my macbook pro/surface setup, that can be removed from the wall and has a typical blank side and a grid on the other. Perfect for debugging when I don’t want to find a notebook. 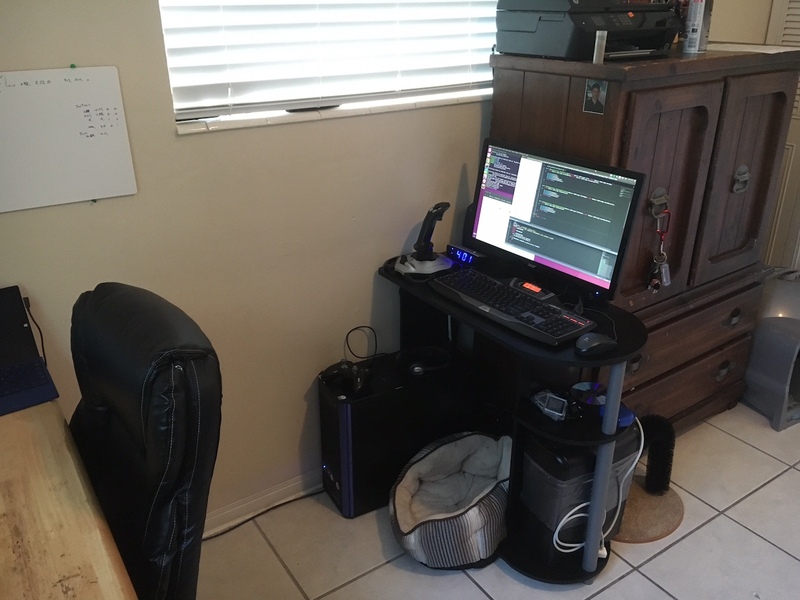 Immediately behind that is my old Core 2 Duo machine which dual boots Windows XP and Ubuntu, mostly found running Ubuntu to assist in development of TurtleBrains. Finally the beast where most of my development efforts are spent and planned. 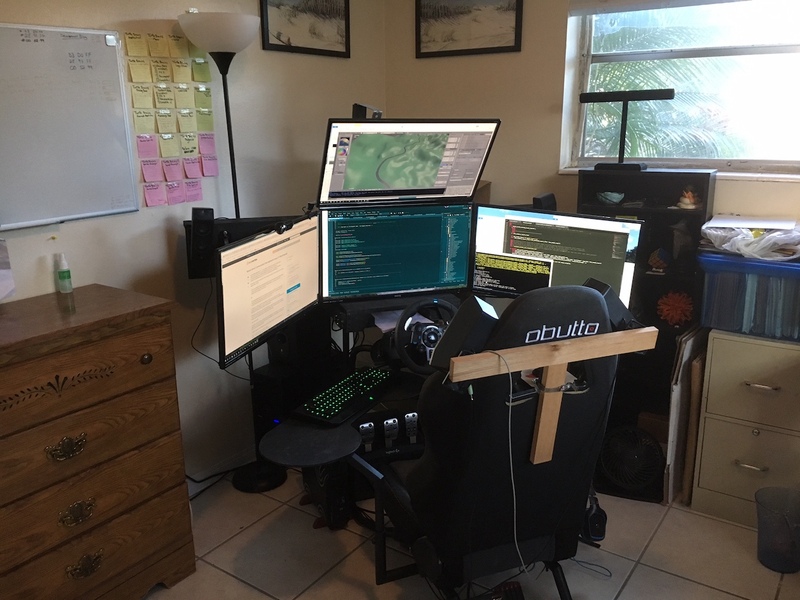 Yes it has four screens and yes it is insane, in a good way. 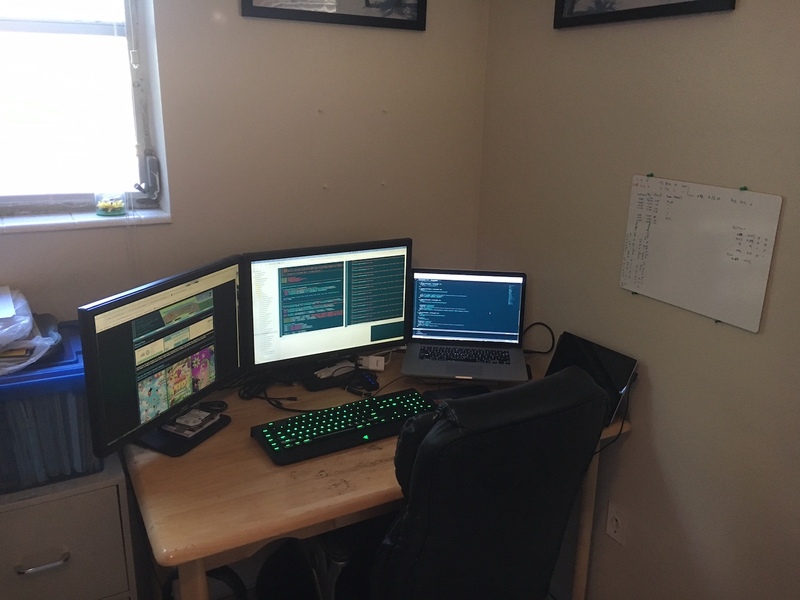 I’ve had a triple screen setup for awhile now, (mid-2008 or so) but adding that fourth monitor really brought it a step further. 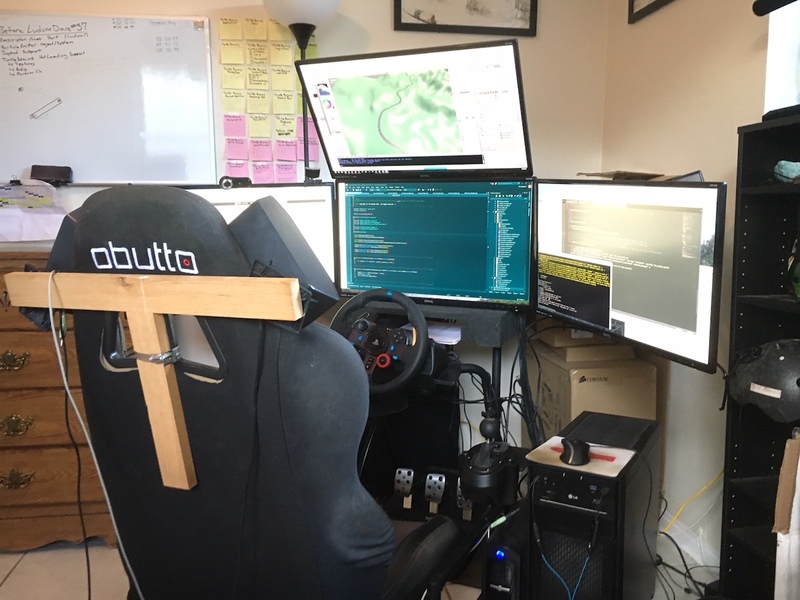 The monitors are mounted on a custom built slide so I can pull them forward when racing and push them away when programming. 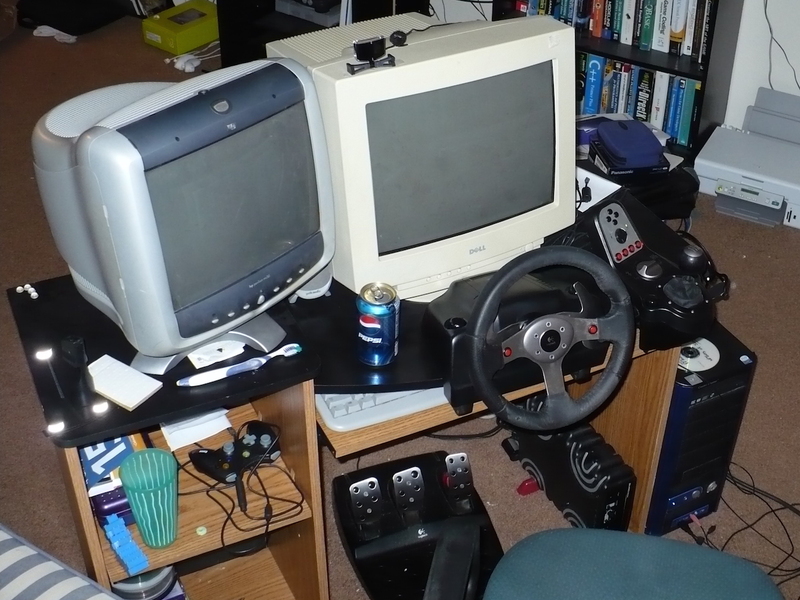 I certainly have used less state-of-the-art setups in my time, this photo here being one of the older setup I actually had a photo of, (2007ish). This entry was posted on Friday, December 9th, 2016 at 6:20 pm and is filed under Game Development, Sim Racing. You can follow any responses to this entry through the RSS 2.0 feed. Both comments and pings are currently closed.